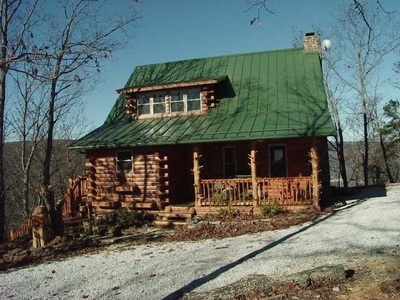 I recently had the opportunity to visit Ozark Bluff Dwellers Cabins, which is owned by Ed French and his lovely wife. 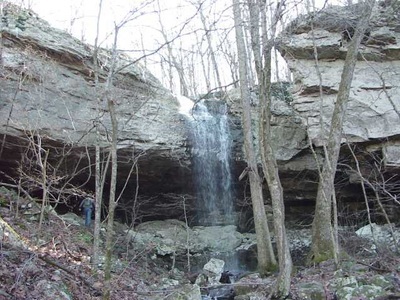 It is situated high above the Buffalo National River Valley near Kyles on Hwy 74. There are three very nice cabins there. I was going to stay in the Cherokee Cabin, the newest of the three. I arrived on a foggy, wet Monday afternoon. I scrambled to get all my stuff into the cabin without getting soaked. As I brought the last of my gear in, I wished hard for some sunshine and clear skies. 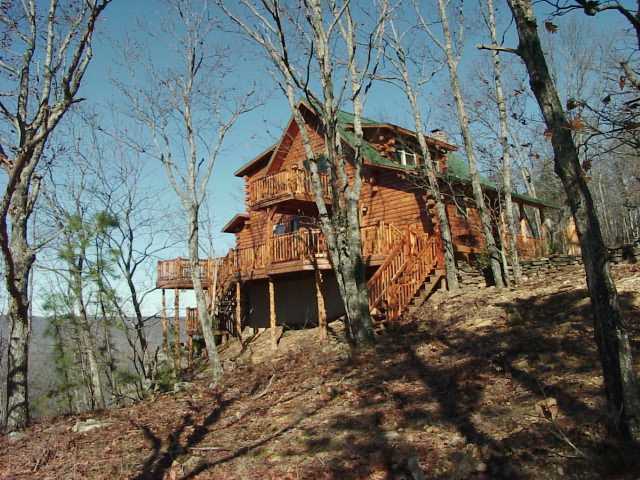 This vacation cabin is located right along Raney Cove and I was hoping to get in a hike or two while staying here. Listening to the rain pelt the windows, I had my doubts. The Cherokee Cabin is beautiful, and appointed with many extras. 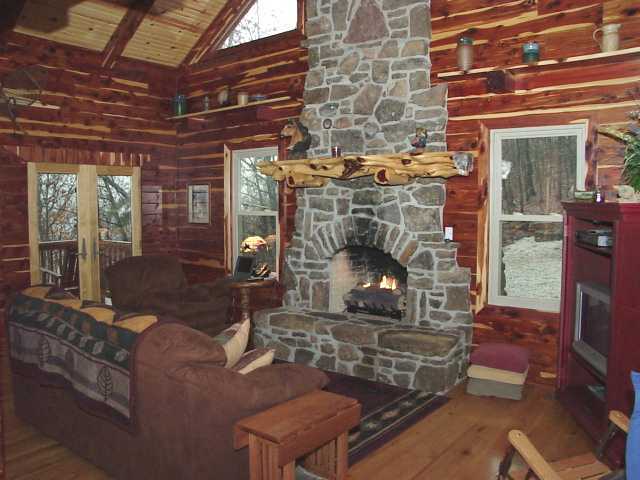 The living room has a gas fireplace, High Definition Satellite TV, DVD and VCR. Several comfortable chairs and a very large couch surround the fireplace. The upstairs Master Bedroom had a huge bed in it and there was a full bath off of that with a jacuzzi tub, shower and a terrific view to boot! I decided to stay in the downstairs bedroom which also had a large bed. Another bath with shower was next to it. 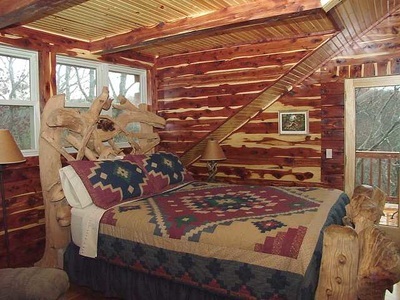 I liked the way this cabin was laid out, much thought was given to providing more that the basics. There was a washer/dryer available for those who might stay an entire week and need laundry facilities. It was early evening and the rain had not yet stopped. The fog had completely engulfed the mountains and I could not see very far out the windows, so I decide to make some supper and then watch a little HDTV. 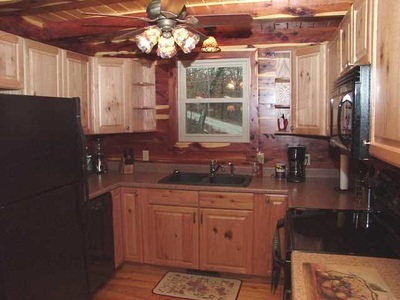 The kitchen at the Cherokee Cabin was deluxe. Complete with dishwasher, large fridge/freezer combo, electric range and oven, microwave and plenty of counter top. Cooking a meal in this kitchen was a pleasure. 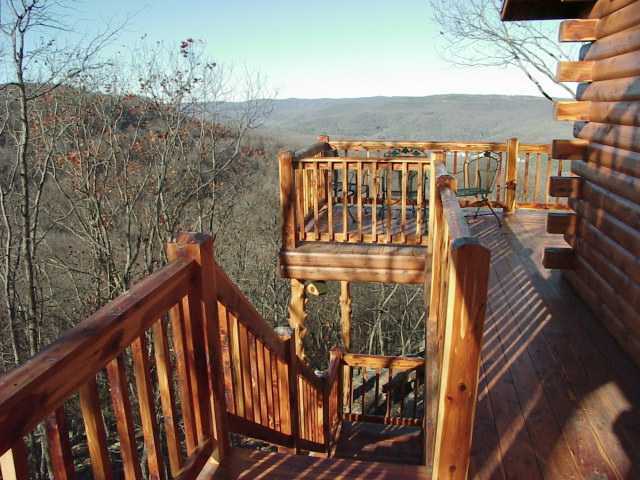 I sat down to a nice meal in the dining area, and looked out the double doors onto the deck. It was still raining. After supper I set up my laptop in the living room, right next to the fire and watched a few movies while checking my email and chatting with friends. I made plans with my good friend Alf Carter to go for a walk if it should stop raining on Tuesday or Wednesday. I fell asleep on the couch (it's way too comfortable) and late in the evening woke up to a hard rain. The fog was still hanging heavy on the mountain top. I went to bed and slept till mid-morning. Tuesday brought another day of fog and rain. I stepped out for a picture, but spent most of the day indoors as the weather turned windy and cold, and still the rain fell. 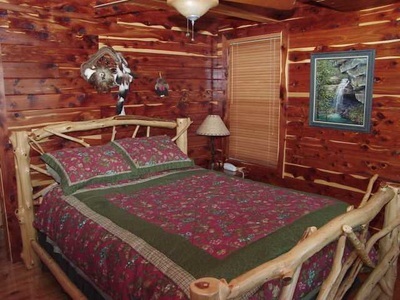 Late in the evening, I took a nice jacuzzi bath and went to bed with a silent prayer for nice weather on my last day at Ozark Bluff Dwellers Cabins. The next morning I woke up early, with the sun just rising in the east. There was blue sky and I could see mountain tops! My prayer had been answered. 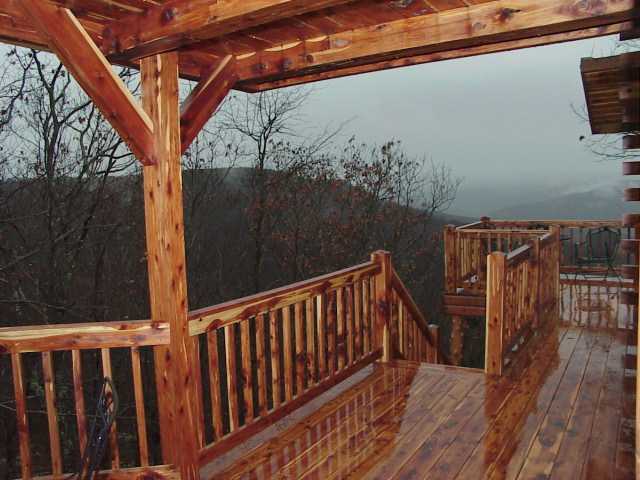 I stepped out onto the deck for my morning coffee and soaked up the view. It was the first sunshine I had seen in three days. Alf called me early and said he would be over around 10:30 or 11:00 a.m. and we would go for a walk down Raney Cove Trail. This trail was built by Ed with the help of Tim Ernst. It meanders down Raney Cove towards the Buffalo River Trail. It stops short of the park, so if you go all the way down you have to bushwhack the last little section to get to the BRT. As we began we could hear what sounded like a waterfall so we headed in that direction first. 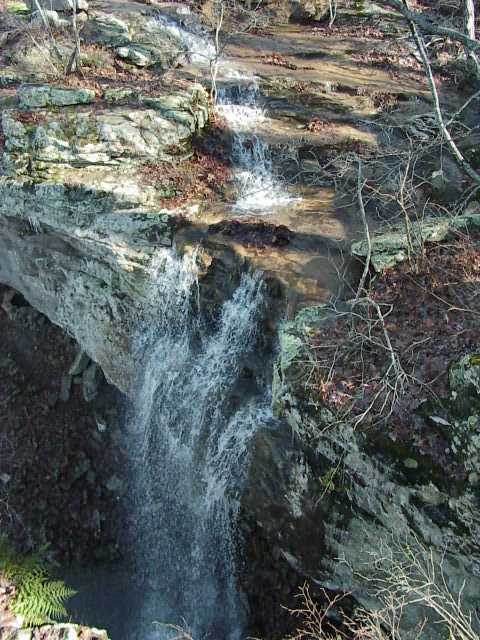 We found the top of the waterfall fairly easily. We could not get a good view of the waterfall from above, so we decided to follow the trail and see if it would take us to the bottom. As the trail made its way over and down the face of the bluff we could see that the water had frozen to the rock and walking this trail would be very tricky. We finally made it over to the waterfall. It was about 20 feet tall, maybe a shade taller. 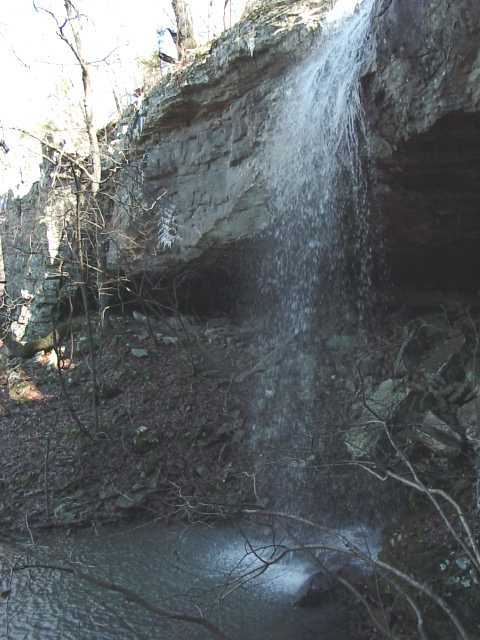 The sun had not yet reached this area, and it was noticeably colder near the waterfall. Small icicles fell from above as the sun began to hit the top of the bluff line. We then followed the trail for awhile, as it made its way along the bluff until we reached a point where it was too slippery to continue. We headed back up the trail and then went over to look at some neat rocks that were in the sun! We sat there for awhile, soaking up some sun before heading back to the Cherokee Cabin. Later, we went over to the Osage Cabin and took the panoramic picture below. I really enjoyed my trip to Ozark Bluff Dwellers Cabins. The accommodations were excellent. 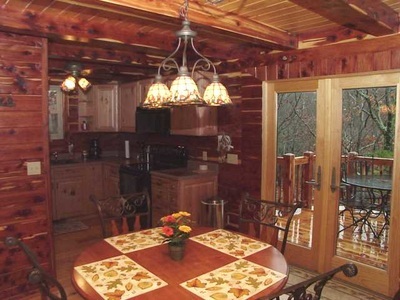 I enjoyed the fine craftsmanship of the cabin and the extra details that Edd and Ilonka have built into each cabin. One of the very nice features is the many decks that you can use. There is always a place out of the rain, or in the shade on a hot, summer day. 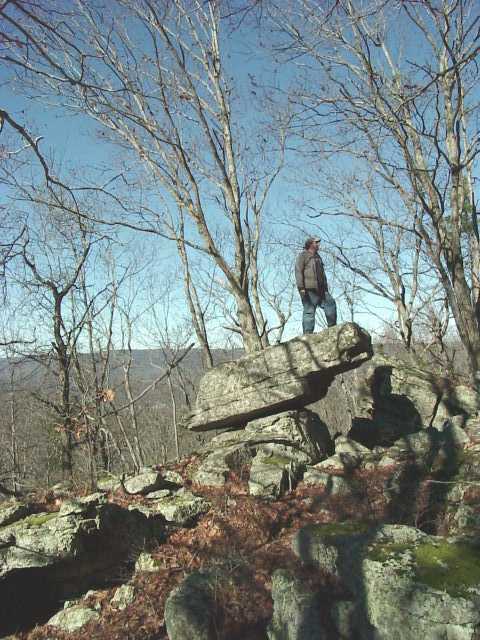 As the old year wanes away and we enter a new year, make a resolution to visit the Ozark Mountains of Arkansas and experience the unique landscapes, rivers and forests that make this area so special. Edd and Ilonka will make your stay a memorable one! I guarantee it. This picture was stitched together from two different views. It shows a section of the Buffalo River Valley from well above Kyles on the left all the way down to Erbie on far right.